A nice feature article on GM Bhakti Kulkarni from Goa, India. It is the only place in the country that still reflects the cultural influence of the Portuguese. The Portuguese landed in India in the early 16th century and Goa remained Portuguese overseas territory as late as 1961. Goa has a nice chess tradition. Read this feature by Marcus Mergulhao. PANAJI: Woman Grandmaster Bhakti Kulkarni pinched herself hard and when it pained, she realized all of what she was witnessing was true. The mild-mannered Goan chess star had just realized her dream of winning a medal and as she shared the podium with Chinese duo of former world champion Hou Yifan (2595) and former World junior girls champion Zhao Xue (2565), she seemed like the odd one out. After all, Bhakti's third place stopped former world woman champion Zhu Chen (2494) from making it an all Chinese podium finish at the Asian Indoor Games at Incheon in South Korea on Wednesday. "It was like a dream come true. It was too wonderful to be true," Bhakti said after her stupendous achievement.Just a day earlier, Bhakti had realized another of her dream when she was drawn to meet former world woman champion Hou Yifan (2595) of China. "I could feel the pressure when I was playing Hou Yifan. But I fought well to keep it level only to lose a pawn in time trouble," said Bhakti. Hou won the game on 48th move and finished as the eventual champion. Once the championship was over, Bhakti could spend more time with the former world champion and gold medalist. "Hou Yifan knows English well and she was talking freely with me," said Bhakti. 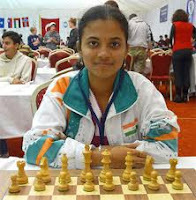 More Indian Chess News: NAGPUR: Rising Aurangabad star, 14-year-old Rutuja Bakshi, settled for a quick draw against Shivani Chaudhari to take home the crown in the Maharashtra State Women's FIDE Rating Chess Tournament which concluded at the Kantai Sabhagruh in Jalgaon. After taking a firm grip in the penultimate round, Rutuja required a draw in the 9th and final round to emerge victorious. The second seeded Aurangabad girl, playing with the white pieces, made no mistake and signed the peace treaty against her Mumbai opponent in just 18 moves to claim the crown. Also: 13th Nagaland state chess challenger underway in Kohima The 13th Nagaland state chess challenger 2013 & under 16 years category got underway here today with minister for youth resources & sports Merentoshi R. Jamir as the chief guest at Red Cross Conference Hall. This year’s edition recorded the highest number of participants (61). Seven year old Pulonito Hesso from Garaggio School, Kohima is the youngest participant and Dziesetuo Rupreo (60 plus) is the oldest participant. Eight year old Shenikali Hesso from Garaggio School Kohima is lone female participant.